KYLE Sandilands has finally explained his beef with David Campbell. Listeners of his KIIS 106.5 breakfast show will no doubt be aware that Sandilands isn't a fan of the Today Extra co-host as he regularly takes pot shots at Campbell. But Sandilands hasn't fully explained why. Until now. Speaking exclusively to news.com.au, the radio star claimed he used to consider Campbell a mate until he "jumped on the bandwagon" and turned on the shock jock. "That c**k breath, I can't stand him," Sandilands said when asked about the singer/TV host/actor. "David Campbell I've known for a long time. Good guy, nice guy. I wasn't hanging out of his pocket but I'd see him and bring him onto our show all the time." "I thought I'd stretched the friendship for him, you know, even though he was on an opposition network." Sandilands and Campbell haven't had a proper conversation in years but the KIIS FM host has come to face-to-face with the Channel Nine star a few times since at media film screenings. Despite laying into Campbell, who is regarded by many as one of the nicest guys in showbiz, Sandilands says he doesn't consider himself to be feuding with the star. "Are there any current feuds? I can't think of any," he said. "I don't start the feuds. They always start it. I always just retaliate. I'm not out there looking for feuds but if some c**k mouths off, they'll know about it." In the past he's been in feuds with comedian Dave Hughes and Rove McManus, both of which Sandilands says he won. "Everyone's failed that's come up against me," the KIIS FM star said. During the interview with news.com.au, Sandilands also touched on his infamous on-air clash with Ernie Dingo. The radio star described the 2008 exchange as "the worst" celebrity interview he's ever had. "I was a Storm Boy fan, I've always loved Ernie Dingo," Sandilands said. 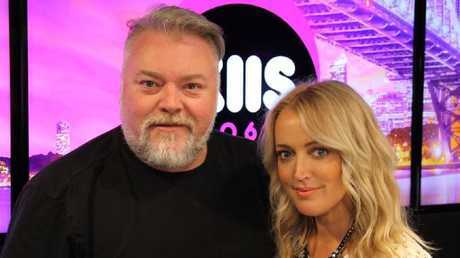 Kyle and Jackie O host the number one FM breakfast show in Sydney on KIIS FM. "Your game is to sensationalise things and you're just basically a commercial wanker," Dingo said on-air.